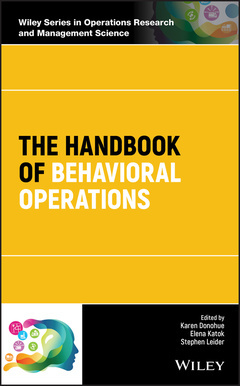 The Handbook of Behavioral Operations offers a comprehensive resource that fills an important gap in the behavioral operations literature. This vital text highlights best practices in behavioral operations research and identifies the most current research directions and their applications. A volume in the Wiley Series in Operations Research and Management Science, this book contains contributions from an international panel of scholars from a wide variety of backgrounds who are conducting behavioral research. * Contains a summary of the methodological foundations and in-depth treatment of research best practices in behavioral research. * Provides a comprehensive review of research conducted over the past two decades in behavioral operations, including such classic topics as inventory management, supply chain contracting, forecasting, and competitive sourcing. * Covers a wide-range of current topics and applications including supply chain risk, responsible and sustainable supply chain, health care operations, culture and trust. * Connects existing bodies of behavioral operations literature with related fields, including psychology and economics. * Provides a vision for future behavioral research in operations. Written for academicians within the operations management community as well as for behavioral researchers more broadly, The Handbook of Behavioral Operations offers a comprehensive resource for the study of how individuals make decisions in an operational context with contributions from experts in the field. KAREN DONOHUE, PHD, is Board of Overseers Professor of Supply Chain and Operations in the Carlson School of Management at the University of Minnesota. ELENA KATOK, PHD, is Ashok & Monica Mago Professor of Operations Management in the Naveen Jindal School of Management at the University of Texas at Dallas, and a Co-Director of the Center and Laboratory for Behavioral Operations and Economics. STEPHEN LEIDER, PHD, is Associate Professor of Technology and Operations in the Ross School of Business at the University of Michigan.